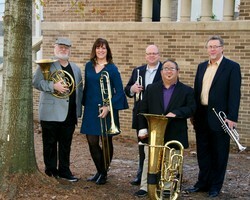 The SFA Faculty Brass Quintet includes, from left, Charles Gavin, horn; Deb Scott, trombone; Jake Walburn, trumpet; J.D. Salas, tuba; and Gary Wurtz, trumpet. NACOGDOCHES, Texas - The Faculty Brass Quintet at Stephen F. Austin State University will perform a concert of classic jazz and popular music when the ensemble presents "Pop Goes the Brass" at 7:30 p.m. Thursday, Jan. 31, in Cole Concert Hall on the SFA campus. The recital is a joint presentation of the SFA College of Fine Arts and School of Music and is a feature of the Friends of Music Concert Series. The SFA Faculty Brass Quintet includes Jake Walburn and Gary Wurtz, trumpets; Charles Gavin, horn; Deb Scott, trombone; and J.D. Salas, tuba. Many of the pieces on the program will feature the jazz and improvisation skills of Walburn, Wurtz and Scott. "The SFA Brass has a long history of performing this type of program for dinner theatre and off-campus concerts," said Gavin, professor of horn in the School of Music. "We decided to do this on campus to start the semester with a concert of all popular hits and new jazz-related compositions." The works will be varied and will feature jazz standards ranging from the music of Duke Ellington and Harry James to popular classics by Herb Alpert and the Tijuana Brass to the music of the rock band Journey. "We hope this program will be a fun and exciting presentation to begin the new semester," Gavin said.